My love for saving money started after college when I started my first job as a second grade teacher. My husband and I had just started our careers, and we had to find ways to live beneath our means so that we could also save for our future. It’s true when they say the earlier you start the better, and it’s never too late to start no matter what age you are! I decided that reading books about finances, saving money, and budgeting was the best place to start. I was able to learn on my own time from reading, and you can do the same! 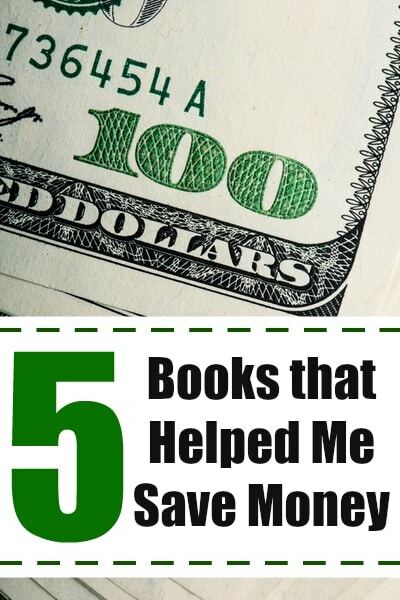 Below you’ll find the list of books that helped motivate our family towards financial success. These books are placed in order in which I read them. Some books I read years ago, and some I’ve read within the last year or so. Take a look and maybe one or two (or all) of these would be of interest to you, too! This is THE book that motivated me to take my very first steps to saving. I read this book in 2005 at our first duty station in Pensacola, Florida. When I was a second grade teacher, I found myself reading this during break times. It didn’t take me too long to get through the book because it was very interesting. I was a young teacher and I knew that saving money as early as possible was key, so I didn’t waste time. We found a financial advisor, set up our first investment accounts for retirement during this time and have been contributing ever since. After reading Smart Couples Finish Rich by David Bach, I wanted to read more of his content. I read Automatic Millionaire in 2007 in North Carolina at our second duty station when I was working out on the treadmill at our apartment gym. This was another great read as it taught us how to save money by setting up automatic payments. Each month, we set up automatic payments to go directly into our retirement accounts and savings accounts. To this day, we still follow the automatic savings plan and it works great for us! The money leaves our account and goes directly to savings each month without us having to worry about it. Every bit adds up over time! I always heard great things about Rich Dad, Poor Dad. I read this book on a flight back from Texas to North Carolina in 2008. I remember mostly reading about assets vs. liabilities as well as financial investing. We continued to invest monthly towards our future. The Total Money Makeover is one of my favorite books of all. I read this book in August 2015 here in South Carolina. This book is THE book that got us back on track after years of saving but not aggressively saving. It’s the book that taught us how to be gazelle intense with our finances. My husband read this book after I did and we both continue to listen to Dave Ramsey’s podcasts daily as well. Thanks to this book, we were able to follow Dave’s Baby Steps and we are currently on baby steps 4-7. We continue to save for college, pay off a rental home, and give at the same time. If I were to recommend that you read any of the books listed first, this is actually the book I would start with. This is a brand new book released in 2016. My husband and I read this in January in South Carolina. Retire Inspired is what I call the kick in the pants that we all need to save for retirement. This is an eye opening book as it motivates us to save even more for retirement. After looking at our own numbers, we realized that we needed to kick it into higher gear and put away even more each month. We discovered Chris Hogan (he has an amazing voice!) on one of Dave Ramsey’s podcasts and on another podcast by Ramsey Solutions, Chris Brown on Air. These three guys (Dave Ramsey, Chris Brown, and Chris Hogan) are three financial pros that I highly recommend listening to this year if you want to get on track financially. We are actively reading this book now. Legacy Journey is another book written by Dave Ramsey. We’ve applied the Dave Ramsey teachings to our life over the last year and it has been so successful that we want to keep learning about ways to build our legacy. We plan to improve our personal finances and budgeting in the new year (2017). If you’d like to get motivated and inspired to get on track this year financially, I highly recommend finding some good books such as the ones listed above to help you get started. Look for these books at your local library or find a good deal on them at Amazon. Then, when you are finished with the books, pass them on to a family member or friend that you feel would benefit from reading them. It took the very first book on the list to motivate me to get started years and years ago, and I don’t regret the decision to start early and save one bit! Have you read any of the books listed above? What money saving books do you recommend? These all sound like great reads. I’ll have to check all of them out. I’m always looking to learn how to make my money work better for me. Thank you for these suggestions. I am always open to ways to save money so I will check these out. These are wonderful finance book suggestions! I definitely plan to read Smart Couples Finish Rich, as planning for retirement is our current hurdle right now.